This hike combines two separate trails into one simple and fairly quick walk. The actual time to do the hike is about 30 minutes to an hour (depending on how much time you linger) and except for a couple of stairs it is fairly level most of the way. 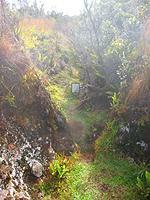 These trails are in the Hawai'i Volcanoes National Park. 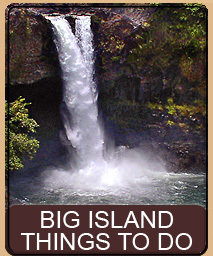 To get to the park entrance, take Highway 11 to Volcano and enter the Hawai'i Volcanoes National Park. Once you pass the park gatehouse continue straight and take the first right into the Visitors Center parking lot. We suggest parking at the far end of the lot, as you will be closer to the trail entrance and exit. This hike combines two trails, each about 1/2 mile in length. Most of the trail has tree cover so you will not need sunscreen hats or food - though you may wish to bring a bit of water and (of course) your camera. Most of this trail is level and easy walking. However, just off the trail are huge crack in the earth - some of them 20 to 30 ft deep. Also, portions of the trail take you very near the edge of the Kilauea Caldera - with a several hundred-foot drop. You should be careful if you have children that they stay on the trail at all times. 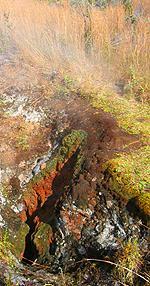 Portions of the trail take you past steaming vents. The steam vents output water vapor - but can be very hot. Never enter a steam vent as doing so can result in severe burns or even death. The last portion of the trail takes you to the sulfur bank. 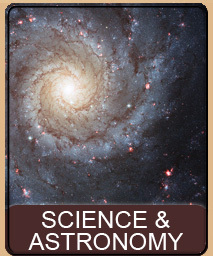 Besides huge earth cracks there are also sulfur fumes. If you have respiratory problems you may wish to skip this portion of the hike. After parking your car at the Visitors Center, face the road. Across the street will be the Volcano House Hotel with the drive into the hotel to your right (across from the exit from the Visitors Center). To enter the trail, walk across the street to the Volcano House Hotel sign and take the sidewalk that runs along the roadway. Follow along the sidewalk as it dips into the trees. 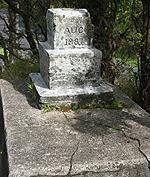 You will walk past a small cement structure labeled Aug 1887 (which we do not, at the time of this writing, have a clue as to what it was for - the park's assertions that it was part of Jaggar's early bunker don't make sense as 1887 predates Jaggar's arrival by almost 30 years). Just past the cement structure are rock stairs leading down the trail. A little way past the base of the stairs you will find the trail splitting into many other trails. Stay to the right taking the trail marked Steaming Bluff. This first portion of the trail is generally covered by trees. 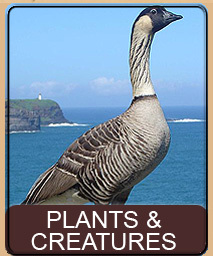 You will walk through native growth including 'Ōhi'a Trees, Hapu'u Ferns, and Uluhe Ferns. As you continue you will emerge and reenter the tree area several times. Portions of the trail take you to the very edge of Kilauea Caldera and offer a splendid look at the entire Caldera - an excellent picture taking opportunity. After a bit the trail will emerge from the trees and you will be near the start of the steaming bluffs. The steam vents are huge cracks in the earth - some of them 20 to 30 ft deep. 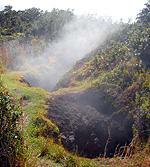 Rainwater seeps into the ground and seeps deeply where it is heated by the volcanic rock and rises in the form of steam. The steam makes its way to the cracks and emerges. You will easily feel the warmth of the steam - and it might be very hot depending on the particular vent. 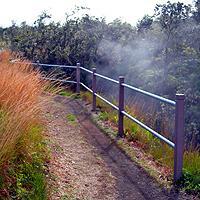 As you walk along the steam vents you will come upon a junction in the trail. 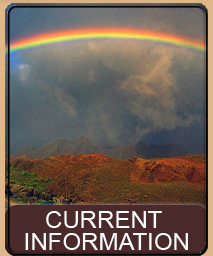 If you take the trail to the left you will enter Iliahi Trail (Sandalwood Trail). 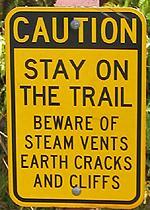 Taking the trail straight will continue towards more steam vents, which you will see in the distance. Taking the trail to the right will take you towards the Sulfur Bank. 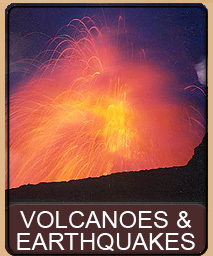 In this particular hike we are going to take the trail right, towards the Sulfur Bank - however, if you wish to take the time and continue forward to the other steam vents, they are quite interesting and there are also excellent views of the Kilauea Caldera from a lookout near the steam vents. When you are finished, return to the junction and take the trail towards the Sulfur Bank. Taking the junction towards the Sulfur Bank will take you through a grassy field and up to the Crater Rim Road. Cross the road and continue along the Sulfur Bank trail. This area is a grassy meadow, and you might ask yourself why there are no trees in the field. The most likely reason is due to the heat in the ground - killing of most everything with deep roots. 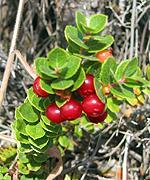 However, along this portion of the trail you will find other interesting plants such as the native 'Ōhelo Berry plants - a natural food source for the Hawaiian Nene Geese It is also a popular berry for pies and jams. You will also see other steam vents in the distance, across the meadow - however it is wise to avoid these as there are no direct trails and it is easy to accidentally stumble into an earth crack. Continue along the Sulfur Bank trail as it once again enters the tree line. As you enter the tree line you will be walking along side of some very deep pits - most of them steaming. However, if you sniff the air you will notice that, unlike the steam vents across the road, this steam is not only water vapor but also has the distinct odor of sulfur. This is the beginning of the sulfur banks and vents. As you continue walking through the forest trail you will notice that some of the plants are very healthy, especially ones growing near the steaming pits. This is due to the moisture and mineral content of the steam - pleasant to many plants that absorb the moisture. After a bit the trees thin until you step out onto another meadow. In the distance you will see the sulfur banks. This particular area, at the time of this writing, is being reworked by the park department. At this time you can either continue straight, or duck under the work ropes and take the trail to the left. If you continue straight, you will walk by some very interesting, colorful and deep pits that line the trail, many of them steaming. If you take the newer trail to the left you will encounter a brand new boardwalk - still being constructed. Either way, you will end up at the same place - the Sulfur Bank. 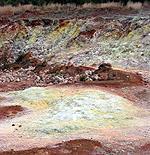 As you approach the sulfur banks you will notice that the ground you are walking on, or are near to, have bright yellow deposits. These are pure sulfur crystals. If you walk a bit off the trail to some of the larger areas of sulfur you can actually find crystals fingernail sized or bigger - absolutely bright yellow and very pure. The steam in the ground works to bring sulfur to the surface in this area, depositing the crystals in the rock and ground near the point where the steam comes out. You might notice that near the sulfur banks is a pile of rocks. If you look carefully at the pile you will notice that the base is not natural, but man-made. Looking into the pile of rocks you may see very large sulfur crystals (note, it is against park regulations to remove rocks or crystals). This pile of rocks marks the first attempt at drilling a geothermal borehole into the volcano. The borehole was attempted in 1925 but was abandoned due to continual destruction of the drill tip. 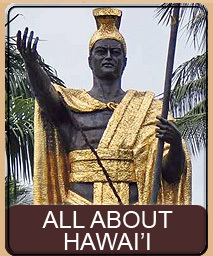 The pile of rocks is all that remains to mark this early attempt at tapping the power of the volcano for the generation of electricity (note, Hawai'i does have geothermal plants running in Puna district - providing power to the island). 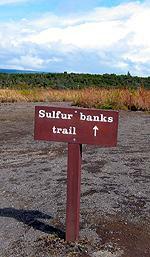 To leave the sulfur banks and return to your car - depending on the construction you can either take the boardwalk trail as it leads behind the sulfur bank, or walk past the boardwalk trail towards Crater Rim Drive and up the steep paved trail just past the gate and before the road. Regardless of which direction you take you will end up at the top of the bank near the Volcano Art Center with the Visitors Center parking lot (and your car) just beyond. This page is named 'Hikes.steamsulphur'. Can't Find It?